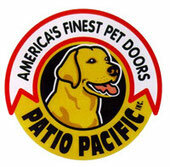 In 2001 Patio Pacific set out to design and build the best pet door flap ever made. The award winning Endura Flap Pet Door is the result of those efforts. If you've never owned a pet door before, you're going to be very satisfied. It does what you think it should. But if you have ever owned a pet door, you're not going to believe how much better this is than what you've had in the past. Dog Fancy magazine agrees, awarding the Endura Flap pet door from Patio Pacific it's coveted Editor's Choice Award in 2007. 9 7/16" x 15 3/4"
13 9/16" x 23 5/8"
14 5/8" x 27 1/8"
Double Flap: One flap on each side. 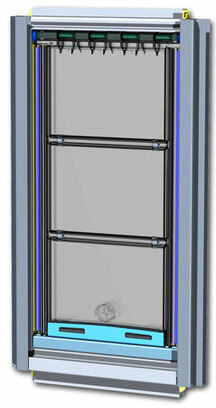 The included dead-air-space and extra flap add significantly to the already considerable insulation and sealing values. The Greatest Advance in Pet Door Design Ever! 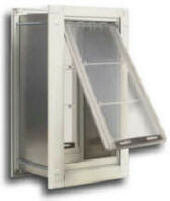 The heart of any pet door is the flap, and pet door flaps have always been a big disappointment to the pet door owner. They leak, they don't insulate, they pinch the pet, they blow open, they don't fit the pet and they wear out quickly so the user needs to buy an expensive replacement flap and start over again. Some have been better than others in one respect or another. But none has ever succeeded in achieving superior performance in every respect. This is particularly true of the brands that are most heavily marketed today. Beginning in 2001, Patio Pacific, Inc, undertook an intensive engineering design effort to build the perfect pet door flap and, based upon that design, to produce a full range of superior pet door products. By Fall of 2004, that work had culminated in the "Endura" Flap Assembly. All brand names are the registered trademarks of their respective owners. Plexidor® is a registered trademark of Plexidor, Inc. Petsafe®, SmartDoor®, Instant Fence®, Safe Dog®, Powercap®, Invisible Fence®, Shields®, MicroLite™, and Computer Collar® are registered trademarks of Radio Systems Corporation. Dogwalk® is a registered trademark of Dogwalk, Inc. Patio Pacific®, Thermosash™, and Endura™ are registered trademarks of Patio Pacific, Inc. Pet Stop®, Safer By Design™, Comfort Contacts™, Gentle Steps™, SmartReceiver®, ComputerReceiver®, UltraElite®, UltraMax®, UltraTuff®, UltraMini®, Ultra Comfort Contact®, OT-100®, OT-200®, OT-300®, Universal Remote Trainer®, Wire-Free™, PetLink™, and SmartStation™ are registered trademarks of Perimeter Technologies, Inc. Pet Fence Pros®, Pet Stuff Warehouse™, PetStuffWarehouse.com™, WifiWirelessDogFence.com™, AlabamaDogDoors.com™, AlabamaPetDoors.com™, Pet Fence Experts™, and Pet Door Experts™ are registered trademarks of McDonald Brothers, Inc. Copyright 2015 McDonald Brothers, Inc.